My doctor sat at his desk facing his computer as he read through my chart and got updated on the various specialists I’d seen and the tests I’d had done since my last appointment with him. It’s true. I’ve seen several new specialists lately and am waiting to see a few more. This is a good thing because it means that after years of trying to politely convince my doctors that there are other things going on, I’m finally getting somewhere. I don’t yet know exactly where that somewhere is, but I’m happy to be on my way all the same and I’m thankful for the understanding and committed doctors who are helping me get there. But it’s still hard. I’m tired of waiting months for appointments to come up. I’m tired of playing trial and error with new medications. I’m tired of just not feeling well day in and day out. I expressed this frustration to my doctor, although I knew there was nothing he could do about it. What he told me, however, actually did help. And because of all that, I also felt encouraged. I was doing a good job. I could keep doing that. It was exactly what I needed to hear, and I can’t help but think that maybe you need to hear it, too. So I want to tell you that you’re doing a good job. Maybe, like me, you’re facing a chronic illness or disability. When you feel like you’re running around in circles searching for a diagnosis, you’re advocating for yourself. When you struggle through difficult treatments and procedures, you’re giving yourself a chance at a better future. And when you find yourself facing a feeding tube, a wheelchair or any other medical device, you’re working within your limitations to be as well as possible and live a life as full as possible. Maybe you love for and care for someone with a chronic illness or disability. When you’re breaking down the walls of your comfort zone in order to learn to care for your loved one, you’re working to accept your new normal. When you’re putting in hours of planning and preparation to help your loved one carry on with life as normally as possible, you’re proving that a challenging life can still be a meaningful one. When you set aside your exhaustion, pain and fear to help your loved one through those feelings of their own, you’re teaching them how to be resilient. We’ve all got something. It doesn’t even have to be illness or disability. We all have things in our lives that are hard. Sometimes we get defeated. Sometimes we’re angry at our circumstances and feel sorry for ourselves. Sometimes we compare ourselves to others and get jealous of those who appear to have it easier. And that’s all OK, because other times our spirits triumph. Other times, we choose to laugh instead of cry and choose to be grateful for what we do have instead of feeling bitter about what we’ve lost. Other times, we reach out and take everything we’ve learned through our struggles to help someone else face their own. We don’t have it all together all the time. We’re not supposed to. But we do what we can. We do our best. So don’t be afraid to give yourself some credit and acknowledge your own strength. Don’t be afraid to give yourself the affirmation that you need. Whether you’re thriving or simply just surviving, you’re doing your best. And you’re doing a good job. 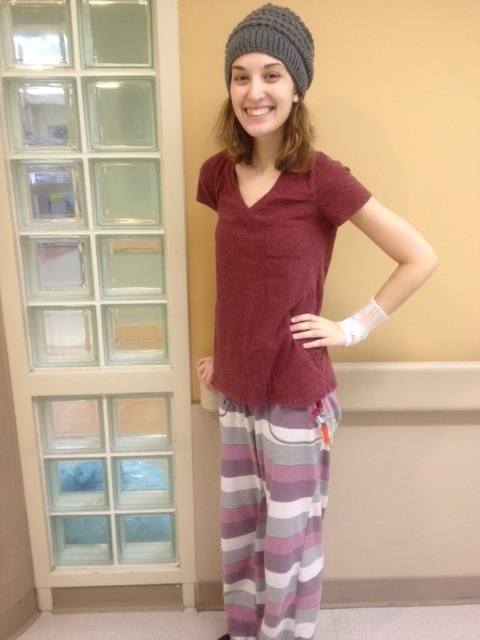 Catherine is a 23 yr old spoonie, tubie & TPNer. Fighting GP, POTS and EDS with joy and humour, one day at a time. Read more from this author on her blog, Finding My Miracle. Catherine! I completely understand your situation and believe that you’re definitely doing a great job! Writing about your illness and sharing the good moments here, is indeed peaceful and encouraging to you and a moment of joy for your readers! But I believe that you should never say ‘chronic’! Because nothing in life is forever. We all go through many circumstances, but that doesn’t mean sunshine is far away! If you believe in the Almighty, you should know that he would not burden you with more than you can handle, and he is miraculous. Doctors would ever say medical terms, would at times, have no solution to our problems, because their knowledge is for sure finite, but God (For me:Allah) has solution to everything. Never lose faith. You will definitely be out of this. I read a number of blogs and participate in some groups that include people with chronic conditions, mostly mental illness. This message, that those who are struggling are doing a good job, comes up very often and is just as important as you say. Thank you for writing about it so well. I received this very same comment yesterday from my physical therapy review. It was a relief for me and my husband when we heard it, and it gave both of us hope to continue fighting, and me getting better. Thank you for sharing this. It is needed out there on so many levels. I am re-posting this. I can relate to what you are going through, I too have been trying to get a definitive diagnosis. It can be so demoralising when, after months of waiting I see a new specialist, my hopes get raised & then dashed again! Unfortunately my doctor is kind but not at all proactive. Thankfully I was fortunate enough to be offered a lengthy series of one to ones with a wonderful therapist. She enabled me to realise that much of my mental health illness was due to my physical illness & extreme constant pain. She helped me to face my uncertain future with courage, in the knowledge that I was doing the best that I could. She told me that I was inspirational! No-one had ever said that before. Although still waiting for answers, I no longer feel helpless or hopeless. I face each day to the best of my ability. I laugh. I smile. I do voluntary work. I have no idea what is around the corner, but with the encouragement of that one special lady, I am able to enjoy my life. I no longer feel a failure! Her positive words helped me to realise that I too am doing the best that I can. Thankyou for your post, it helped to remind me of my blessings.